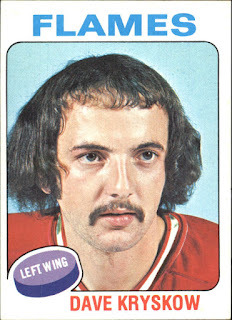 How is this for hockey's worst hair cut? That's Dave Kryskow. He bounced around the NHL and WHA in the 1970s, playing with Chicago, Washington, Atlanta, and Detroit in the NHL and Calgary and Winnipeg in the WHA. When all was said and done, Dave nicely competed in 231 NHL games and 116 WHA contests. Dave was actually a pretty high draft pick, 26th overall in 1971, selected ahead of players such as Bill Hajt and John Garrett. But for whatever reason he never panned out in Chicago, even though as a rookie in 1973 he scored goals in two different games of the Stanley Cup finals. The Blackhawks left him unprotected in the 1974 NHL expansion draft. The Washington Capitals made Kryskow their first forward selected in the expansion draft. He played just one season in Washington. His claim to fame is a good trivia question. He was the first Washington Capital player to score a shorthanded goal in franchise history. That wasn't enough, as three-quarters of the way through the season he was traded to Detroit. He must have lived out of a suitcase because he never stayed in one place very long. Kryskow, a junior scoring star, survived in big league hockey in a defensive role. And he had to try doing that on a series of poor defensive teams. One of the most underrated players of the 1980s was Washington's Swedish center Bengt-Ake Gustafsson. Gustafsson was a quiet, unassuming player. Part of that was because he was a European pioneer. Much of it was because he starred with the Washington Capitals. In the days before every game was on television, nationally broadcasted Washington Capital games were rare. In The 6'0" 185lb native of Kariskoga, Sweden reminded was very similar to Vancouver's Swedish standout Thomas Gradin. Both were incredibly skilled players on teams without a lot of gunslingers. They were very solid in most facets of the game, even excellent in some. But outside of local fan memories, history has all but forgotten both of them. Bengt-Ake Gustafsson was a superb skater and puck handler. The lanky Swede had a long, fluid stride combined with great balance, making him surprisingly tough to knock off of the puck. He had breakaway speed, capable of reaching full speed in less than three steps. "Gus" had the stick skills to match his skating gifts. He was capable of doing everything within his arsenal of puck tricks while at top speed, making him a natural threat on both specialty teams. He had excellent vision and anticipation, which he combined with his one-step quickness to create passing lanes. Though not a noted physical player, Gustafsson was definitely not intimidated by the rough going. He was never afraid to do the dirty work in the corners or in the front of the net, though he was smart enough to dart in and out of these work zones. He wasn't afraid to initiate contact either. Some will remember one devastating hit in particular when "Gus" knocked New York Ranger Rob Ftorek out of a game with a thunderous check in retaliation for an earlier Ftorek spear. A conscientious two way player, it there was one true fault to Gustafsson's game was his desire to pass rather than shoot, a trait extremely common of European trained players in the 1980s. Gustafsson had a good shot, particularly his snap shot that he released quickly and accurately. He was deadly within 10 feet of the net, particularly in his favorite power play perch at the base of the left face-off circle. In the 1978 NHL Amateur Draft, the Washington Capitals selected Gustafsson 55th overall. After helping Sweden capture a silver medal at the 1978 World Championships, Gustafsson headed to North America, but joining the WHA's Edmonton Oilers instead. Gustafsson would play just two playoff games in the Alberta capital. After scoring 1 goal and 3 points, he was ruled ineligible to play by the WHA since teams could not add European free agents so late in the season. The following season saw the Oilers and other remaining WHA teams merge with the NHL. Gustafsson was initially one of four players protected by the Oilers in the merger, along with goaltenders Ed Mio, Dave Dryden and a teenage forward named Wayne Gretzky. Gustafsson was on record as wanting to stay in Edmonton. The Capitals weren't going to let Gustafsson slip out of their hands that easily, and argued that Gustafsson was their property. On June 9th, 1979 the Caps further strengthened their claim by selecting Gustafsson in a special reclaim draft. The matter would eventually be sorted out by NHL president John Ziegler. Gustafsson would move to the American capital, and enjoy a fine 9 year career which ranks him among the best players in franchise history. He would score 196 goals, and 555 points in 629 career games. His best season came in 1983-84 when he scored a career high 32 goals and 75 points while playing with linemates Dave Christian and Mike Gartner. Gustafsson had a particularly memorable game on January 8, 1984 in Philadelphia. He tied a club record for most goals in a game with 5! Gus scored on every shot he took that game. A pulled left hamstring plagued Gustafsson the following season, but he would rebound nicely in 1985-86 by leading the team in assists and equaling his career high of 75 points. Late in the season, however, disaster struck. Gustafsson's right leg was broken in a spectacular spill involving New York Islander defenseman Denis Potvin. Not only did Gustafsson miss the rest of the season and the playoffs, but he would not play in the NHL the following year either. Feeling he lost a significant step of speed, Gustafsson returned home for the 1986-87 season, playing for Bofors, essentially a development team in his hometown. Gustafsson used the season to reinvent his game after breaking the leg. By the end of the year he was back to top condition, leading Sweden in the world championships to a gold medal, the first for the country in 25 years. He also led the Swedes in the Canada Cup that September. Gustafsson returned to Washington in 1987 and picked up where he left off. His scoring totals were off slightly, but his playmaking abilities were a definite shot in the arm of the Washington power play. Gustafsson returned to Sweden for good in 1989-90. He would play in his hometown until 1993, and continued playing for the national team, including in 1991 when the Swedes recaptured gold at the world championships, and in 1992 at the Olympic games. He would later find a home in Feldkirch, Austria. Unbeknown to most North American fans, he continued to play until the conclusion of the 1998 season. In his final season, at the age of 40, he led Feldkirch to a stunning European League victory. Gustafsson would turn to coaching following his playing days, manning benches in Austria and Switzerland before returning home to Sweden. He would lead his Farjestads to victory in his first season. In 2003 he would be elected into the International Ice Hockey Hall of Fame, though his contributions were far from over. In 2006, he was head coach of the Swedish national team that finally won Olympic gold. March 7th, 1989. One of the bigger trades in NHL history sees the Washington Capitals trade Mike Gartner and Larry Murphy to the Minnesota North Stars in exchange for Dino Ciccarelli and Bob Rouse. What a trade! In essence it broke down as Gartner for Ciccarelli, the two goal scoring faces of each organization now swapping teams. Both were destined for the Hockey Hall of Fame, as was the defenseman Larry Murphy. But Bob Rouse? Who was he? Well, make no mistake, Bob Rouse was not a Hall of Fame defender like Larry Murphy. In fact, he was not like Murphy in most respects. He had little offensive upside, with not much of a finesse game to speak of. He was a rock solid physical defender. He kept the front of his net neat and tidy, using his size and strength to his advantage. He lasted a long time in the NHL (well over 1,000 NHL games) as a very tough and honest defenseman. Rouse, who was often paired with Craig Hartsburg in Minnesota, was perhaps best described as the prototypical stay at home defender in the modern game. He wasn't a great skate, but he excelled when playing within his limitations. He handled the puck nicely and had enough vision to calmly make a strong play to get the puck out of his zone. But he never made much of an offensive contribution. Rouse would play 3 seasons in Washington before joining the Toronto Maple Leafs (with Peter Zezel) for another dynamic offensive defenseman in Al Iafrate. Rouse would play a nice role with a strong Leafs team, though he may be best remembered for a nasty stick fight with Detroit's Bob Probert. Rouse joined the Red Wings in 1995 and was part of the Wings back-to-back Stanley Cup championships in 1997 and 1998. He later finished his career in San Jose. All told, Bob Rouse played in 1061 NHL games, scoring 37 goals and 181 assists for 218 points. He added 1559 penalty minutes, and administered probably just as many bruises. In the playoffs Rouse added 7 goals, 28 points, and 198 PIMs in 136 Stanley Cup contests. October 23rd, 1974. Washington goaltender Michel Belhumeur stops not one but two(!) penalty shots in the same game. He stopped both of Chicago's Jim Pappin and Stan Mikita. Yet despite the two big saves, somehow the Capitals lost that game 3-2 to Chicago. Washington lost a lot of games that year. 67 of them in total. They won just 8, and tied 5. They were one of the worst teams in NHL history. They were so bad that when the season mercifully ended the players celebrated by hoisting an aluminum garbage can as if it was the Stanley Cup. Washington, an expansion franchise, had hope Belhumeur could be their go-to goalie in their inaugural season. He had previously wallowed in the Philadelphia Flyers organization, buried in the minor leagues while Bernie Parent was leading the Broad Street Bullies to the Stanley Cup. Belhumeur toiled in the minor leagues mostly, playing for the Quebec Aces and Richmond Robins. The Caps grabbed Belhumeur for the 1974-75 season, but let's just say it did not work out too well. Belhumeur's personal record was 0-24-3 in 35 games - a NHL record for most games played in season without a victory. He had a GAA of bloated 5.36. Ron Low, the other Washington goalie, won all 8 games for the Caps, but his record of 8-36-2 is nearly as horrific. But don't blame the puck stoppers. The goalies had no chance with that poor Washington team in front of them. Belhumeur returned the next season for 7 more games (0-5-1) before disappearing to the minor leagues until he retired in 1979. By the way, Belhumeur did get to taste victory in the National Hockey League. He did pick up 9 wins in 23 games with the Flyers in 1972-73. Interestingly, before Belhumeur left Philadelphia he actually sued the Flyers. He was a minor league call up for the 1974 playoffs. His role was a practice/emergency goalie, but he never dressed for a game even as back up. Still, Belhumeur felt he deserved to get paid for his contributions. The issue was settled out of court. How good of a prospect was Sylvain Cote? In his last year of junior he was named as an all star and the top defenseman in the entire QMJHL even though he played in only 26 games! Drafted 11th overall in 1984, Cote was a naturally gifted skater right from an early age. To this day many will argue he put on the best showing of any player at Quebec's famous pee-wee international tournament, with none other than Guy Lafleur also getting a lot of support. Cote grew up playing minor hockey in the same neighborhoods as Mario Lemieux. The two were clearly the best prospects in Quebec by their draft day. Of course everyone knows all about what Mario Lemieux accomplished in the NHL. But not many people remember Sylvain Cote, which is somehow par for the course as he inexplicably flew under the radar much of his NHL career. Though he started his career with 6 seasons with the Whalers, he blossomed in Washington where he played in two stints for over 9 seasons. The Caps were deep on the blue line back then, with the likes of Kevin Hatcher, Calle Johansson and Al Iafrate stealing much of the spotlight. Cote settled in nicely behind Hatcher as the 2nd pairing right defender, quietly providing solid play at both ends of the ice. Offensively he was highly underrated, except in 1992-93 when he tallied 21 goals. The Capitals set a NHL record that season with three defensemen topping the 20 goal mark with Hatcher and Iafrate also reaching the mark. Cote had a strong and accurate shot, making him a perfect candidate to take a lot of power play minutes. At regular strength he was a strong skater and carried the puck well under pressure. He was also a confident breakout passer. But after his big breakout campaign in 1992-93, Cote took more of a two-way role, allowing others to concentrate more on the offensive side of the ice. Defensively Cote improved over the course of his career into a very solid and capable defender, although he was always best suited on the 2nd pairing. Not unlike most defensemen it took him a few years to really be able to process the offensive attack heading his way. The league's best superstars, namely Lemieux, could exploit Cote from time to time. He was not very big (5'11" and 185lbs) but was a solid hitter who finished his checks, though with no malice. All in all Sylvain Cote was a solid NHL citizen for 1171 NHL games. He scored 122 goals and 313 assists for 435 points. He added another 11 goals and 33 points in 102 playoff games, but he never did get a chance to sip champagne from Lord Stanley's Mug. A passionate fisherman, Sylvain Cote later opened his own fishing charter business in Maryland. Lou Franceschetti made himself a good living as a hard working third or fourth line player His game was based on total heart and dedication, not necessarily skill. "I was somebody that was going to go out and create a little bit of energy for your teammates, create a little bit of havoc and just want to keep the other guys on the other team honest at all times knowing that when I was out there I was there to make things happen and the game could get a little physical," he said. Franceschetti was drafted 71st overall in the 1978 Amateur Draft by the Washington Capitals, the team he spent the majority of his career with. More accurately he split most of his career between the American capital and the American league. In fact he spent 3 full seasons in the minor league level before finally getting a shot at a taste of NHL life in 1981-82, when he appeared in 30 games. But Lou would spend most of his season in the minors. The next three seasons were almost carbon copies of 1981-82. Solid minor league season hi-lighted with a peppering of NHL action. Lou finally made the Caps on a full time basis in 1984-85 when the 6' 200lb right winger participated in 76 NHL games. He would be a mainstay on Washington's right wing for the next three seasons with the exception of 16 minor league games. He was never much of a goal scorer or playmaker, but he was a fan favorite as they loved to chant his name. He was a valued fourth line plumber, which is quite fitting considering he supplemented his minor league income by working as a plumber during the off-seasons. In the summer of 1989 the Caps traded Franceschetti to Toronto in exchange for a draft pick. Lou surprisingly exploded in his first season with the Leafs, scoring 21 goals and 36 points, both career highs, in 80 games. Lou would be traded to Buffalo 16 games into the 1990-91 season, but he struggled terribly with the Sabres, scoring just once in 35 games. To make matters worse, Lou faced the pressure of knowing the Sabres traded Mike Foligno - one of the all-time favourites in Buffalo in order to get him and defenseman Brian Curran. Aside from 1 game during the 1991-92 season with Buffalo, Lou would played 5 years of minor league hockey before retiring in 1996. He would later become involved in Roller Hockey International, including competing for the Buffalo Stampede and Buffalo Wings. Lou played hard and with good speed. His determination and willingness to sacrifice impressed all. He used his body effectively as he hit purposefully rather than recklessly. A good and willing fighter, Lou left the NHL with career totals of 59 goals and 141 points in 459 regular season games. Always underrated in my books, Joe Reekie was one of the best kept secrets in the National Hockey League. Originally Drafted 128th overall in the 1983 Entry Draft by Hartford, Reekie re-entered the Draft in 1985 and was taken 119th overall by Buffalo. The big, aggressive Reekie would appear in 104 games over 4 years with the Sabres. He was already developing a reputation for an uncanny sense of perfect defensive position that was usually reserved for veterans. However a serious knee injury really slowed his progress, as it cost him most of the 1987-88 and 1988-89 seasons. The Sabres traded Reekie to the New York Islanders prior to the 1989-90 season where he would play 3 seasons mostly in the National Hockey League. In that time he quietly impressed as a penalty kill regular. His combined +45 rating over three years convinced the Tampa Bay Lightning to select him in the 1993 expansion draft. Reekie would spend almost two seasons in the Florida sunshine before finding a home in Washington. From 1994 to 2002 Reekie served as a top four defender. He was often used against the other team's top players because of his strength and seemingly flawless defensive positioning. He was smart and tough, although that brought inevitable injuries that slowed him. Regardless, he always played with a subtle savvy that I always admired, as well as with a tough and physical, yet clean, presence. Reekie was traded on January 17th, 2002 to Chicago for Petr Dvorak, and would finish his 17 year career following the 2001-02 season. When all was said and done Joe Reekie had participated in 902 NHL matches, scoring 25 goals and 139 assists for 164 career points. He added 3 more goals and 7 more points in 54 Stanley Cup contests. Impressive numbers? No. But every coach in the league wish they had a dependable defender like Joe Reekie on their blue line. The key to Bondra's game was always his skating and shooting. Bondra was an explosive skater with a wide skating stance that gave him impenetrable balance. With a loose puck up for grabs he was like a sprinter out of the starting blocks. He could handle the puck too at top speed, often cutting in on his off wing and shooting in stride. Though his season totals were consistently high, he was a bit of a streaky player, scoring goals in bunches. Bondra always had a goal scorer's mentality, firing shots on net whenever and from wherever possible. He had a lethal arsenal of shots, notably his wrist and backhand shots. Twice he led the league in goal scoring, 1994-95 and 1997-98. He finished his career in Washington holding Capitals team records in goals (472), points (825), power-play goals (137), game-winning goals (73), short-handed goals (32) and hat tricks (19). Despite his offensive wizardry, "Bonzai" was a pretty anonymous player all things considered. Playing in Washington did not help him get into the spotlight, but Bondra also shunned the spotlight as well. He was simply not interested in such media and fanfare. On his best days Peter Bondra was comparable to Pavel Bure or Alexander Ovechkin. He was that good, and scored goals with the same infectious exuberance. Though he was not a noted playmaker, Bondra was a very committed team player. He did not neglect his defensive duties, and was a regular on the PK unit. Though he was 6'1" and over 200lbs, he was not an overly strong player in terms of muscling out players along the boards. But he would get his nose dirty. For all his efforts, team success was tough to come by in Washington during the 1990s. Only twice did the team make it past the first round of the playoffs. In 1998 the Capitals made a surprise visit to the Stanley Cup finals, though the team fell just short to the Detroit Red Wings. Washington has traditionally been a very loyal organization, keeping players in town for long periods of time. If there was ever a player who deserved to finish his career as a Washington Capital, it was Bondra who truly loved being a Cap, even though there was a couple of public rough spots. Unfortunately it was not meant to be. The struggling Caps moved Bondra to Ottawa, starting a rebuilding phase and allowing the tearful Bondra to play with a contender. Unfortunately Ottawa didn't make it past the first round. Bondra bounced around after that, playing with Atlanta and Chicago and with HK SKP Poprad during the lost lockout season. The aging veteran was never the same goal scorer once he left Washington. In the fall of 2007, Bondra announced his retirement from playing hockey. He had been hoping for a one year contract offer from the Capitals so that he could finish out his career where his heart had always been. But the offer never came. A different offer did come, and it was close to Bondra's heart too. The powers that be in Slovakia offered Bondra the job as the national team's general manager. The proud Slovak was eager to accept the challenge. Bondra represented in seven international competitions during his playing career, including the 1994 Winter Olympics qualifying tournament, the 1998 Winter Olympics, the 2006 Winter Olympics, the 1996 World Cup of Hockey and the Ice Hockey World Championships in 2002 and 2003. Perhaps his greatest career highlight was in 2002 when he led the Worlds with 7 goals en route to a Slovakian gold medal. He scored the tournament clinching goal with just 100 seconds left in the game Overall, he played 47 games and scored 35 goals on international level for Slovakia. Some people called Dale Hunter the NHL's ultimate warrior. Others considered the loathsome character to be hockey's most hated villain since Bobby Clarke. Love him or hate him, you have to admit he was a vitally integral player. Hunter retired as the first and only man in NHL history to collect 300 goals, 1,000 points and 3,000 penalty minutes. But while he was a superior defensive player, face-off specialist and offensive sparkplug, it was Hunter's mean-spirited, sometimes dirty play that summed up Hunter best. He was the ultimate team player and leader; a player who played with every last ounce of heart and soul he had; a player who would and did just about anything to win. The NHL's Lord of Darkness wreaked havoc at any given opportunity. "I assumed he picked his spots to play the way he does because nobody can play that way all the time," goalie Bill Ranford, both an opponent and teammate, said. "Then I found out he plays that way every game, every rink, against everybody." In a career of wrong-doings, one incident sticks out more than any other. A frustrated Hunter blindsided NY Islanders captain Pierre Turgeon several moments after Turgeon scored a decisive goal that all but eliminated Hunter's Capitals from the playoffs. The attack came a good 5-7 seconds after the goal as Turgeon was celebrating the goal. Hunter was suspended for the first 21 games, exactly 1/4 of the schedule, in the following season. With fines and lost salary, Hunter lost $150,000. "Some wondered whether the new NHL commissioner Gary Bettman singled me out to send everyone a message, but to me, that's just part of hockey," said Hunter almost unapologetically. Dale was the middle brother of 3 brothers who all played in the NHL. Older brother Dave was a third line grinder with the great Edmonton Oilers teams, while younger brother Mark was a solid player for a long time span as well. "Having older brothers who play Junior A (oldest brother Ron played Jr A but not pro) and professional hockey before I did made my progression easier. Dave let Mark and me know what to expect. His most helpful advice was 'Be noticed.' To make a team, you have to do something to draw attention to yourself," remembers Dale. Dale took that advice to heart, and it helped to mold his career. "I'm a smaller guy, so I've always needed to play the same energetic and aggressive style to show that I can compete against the bigger players. Unless he's super talented, a small man doesn't play in the NHL. I remembered Dave's advice and I guess I racked up a few penalty minutes as a result. I almost went out of my way to knock heads with the toughest guys on the other teams just to prove that I wasn't afraid to play in the league. I got beat up quite a few times, too many to count!" Dale was selected 41st overall by the Quebec Nordiques in 1979. A year later he was knocking heads in the NHL. In his rookie season he gained instant respect for his all out play that earned him 226 PIM. But he also added 19 goals and 44 assists for 63 very respectable points. That first year Dale met another NHL classic villain in Moose Dupont, who was finishing his NHL career with the Nords. Moose left a lasting impression on Hunter. "Moose Dupont was captain of the Nordiques when I first broke in. He helped me a lot. He had been one of the main guys from the Cup winning Philadelphia Flyers and brought his love of the game to the rink every day. He laughed, had fun, and played hard. He didn't let it get to him if things didn't go the way he wanted. I loved his attitude." With the emergence of Hunter, high scoring Frenchmen Michel Goulet and the three Stastny brother, the Nordiques became one of the league's more exciting teams. Goulet was a terrific goal scorer, scoring 50 goals several times. Many think that Goulet was Stastny's left winger, but more often than not it was Hunter to who centered the Hall of Fame left winger. (Stastny and Goulet were a dynamic power play combination however). That in itself speaks volumes of Hunter's finesse game. A fine passer with superior vision of the ice and a great understanding of the game, Hunter's only finesse-game weakness was his skating. A choppy stride gave him only acceptable speed in his prime and hindered somewhat in his latter years, but he always found a way of getting the job done. The Nords were unfortunate not to have better playoff luck. For much of the early 1980s they were a high scoring team that seemed to lack an elite goalie and dominant defenseman to get them over the hump. While Stastny and Goulet got much of the credit due to their incredible scoring exploits, it was Hunter who was considered to be the team's heart and soul. When the retooling Nords traded Hunter in 1987, it was said that the franchise was never the same. They missed the playoffs for the next 5 years and eventually Quebec City even lost the team to Denver, Colorado. Hunter was traded to the Washington Capitals on June 13, 1987. With Clint Malarchuk also going to the US capital, the Nords got Gaetan Duchesne and Alan Haworth in return. The traded wasn't all bad from a Nords standpoint though as they also got Washington's first round pick which was used to select Joe Sakic. Hunter quickly became the heart and soul of the Capitals, and later was officially named as the team's captain. He helped the team to become a strong team during his tenure. However playoff success, much like in Quebec, was hard to come by as the Caps ran into the might Pittsburgh Penguins in the early 1990s. Late in the decade, 1998 to be exact, the Caps made a surprise Cinderella run to the Stanley Cup finals. It marked the first time in 18 years that Hunter had made it to the finals, but the clock struck 12 on the Caps as the Detroit Red Wings won their 2nd straight Cup. Much speculation in the media suggested Hunter would retire that summer, but he came back for one more chance at the Cup. However the Caps had a injury plagued season and were destined to miss the playoffs by the time of the trading deadline. It was at that point that the classy Caps organization traded Hunter to the Colorado Avalanche in an attempt to give him one last shot at the Cup. It was ironic that Hunter was traded to Avs of all teams. For so many years he poured so much sweat and heart into that franchise. The Avs of course were previously known as the Quebec Nordiques. Despite a Colorado upset over defending champs Detroit, Colorado was unable to get past the eventual champion Dallas Stars. Hunter had to decide if he wanted to come back again to try to get that elusive Cup, but he opted not to. Hunter finished with 323 goals and 1,020 points in 1,407 games in his career. He ranked second all-time with 3,565 regular-season penalty minutes, trailing only Dave "Tiger" Williams. Hunter tops the all-time list for post-season penalty minutes with 729 in 186 games. Bruce Cowick made his NHL debut during the 1974 Stanley Cup playoffs. Cowick, who was acquired that season after two years of physical play in the old WHL, had never played a single NHL game until the playoffs. The Flyers felt they needed to add some extra muscle up front as some of their regular bangers were banged up themselves with nagging injuries. Cowick got the call, not because he could score (he had 14 goals and 21 points in the AHL that year) but because he could handle himself in the corners and when the gloves were dropped. He was also fairly solid defensively. Cowick played in 8 games that spring. He didn't get a lot of ice time but did get on the ice long enough to earn 9 penalty minutes, including a 5 minute major for scuffling with the Boston Bruins Rich Leduc. But while he had never played in the NHL before and only played in 8 playoff games, Cowick got his name on the Stanley Cup as the Philadelphia Flyers won their first NHL championship. For Cowick, it was partly a case of being at the right place at the right time. Prior to Cowick's debut, most people had never head of the Victoria BC native. He earned a reputation as a tough as nails winger with the BCJHL Victoria Cougars, but was never picked up by an NHL team. Instead he signed with the WHL's San Diego Gulls for 2 seasons where he showed he could do more than just fight. The Flyers acquired him in exchange for Fred Stanfield, Tom Trevalyn, Bob Currier and Bob Hurlbury in July of 1973. With Cowick's name on the Cup and his play at the minor league level, the Washington Capitals claimed him in the 1974 NHL Expansion Draft. It was a good move for Cowick in some ways, but not others. Cowick played the entire 1974-75 season with the expansion Caps. He appeared in 65 games and scored 5 goals and 11 points plus 41 PIM. He was also a bad -42. But for Cowick his dream had come true, he made the NHL. However the Caps were a pretty sorry team that first year. He had to endure a season of 67 losses in 80 games. Cowick was exposed on waivers in May of 1975 and was picked up by the St. Louis Blues. Cowick appeared in 5 games for the Bluenotes but spent most of what proved to be his final professional season back in the American Hockey League with the Providence Reds. While he spent much of his hockey career as a "policeman," he spends all of his current career as a policeman literally. He is an RCMP officer in Esquimalt, British Columbia. He is part of the Community Police Unit which is responsible for all matters relating to community policing, crime prevention, Block Watch and Block Parents programs, and school liaison programs.